iP3: Why did Foursquare executives check in at Apple Inc? Why did Foursquare executives check in at Apple Inc? A few days ago Foursquare’s co-founder Dennis Crowley, a PR representative, and a business and partnerships executive are enjoying burritos at Apple’s employee cafeteria on the 1 Infinite Loop campus in Cupertino, California. But why?Apple is known to be looking at key acquisitions to put them even farther ahead of their competitors, maybe Foursquare would be a good pickup? Apple is rumored to be working on a new, location based social networking system called ‘Find my Friends. Foursquare is a new social network that is all based on location and “checking in” at locations. Foursquare even has a popular application for the iPhone, Android, Palm, BlackBerry, and Nokia’s Ovi platform. 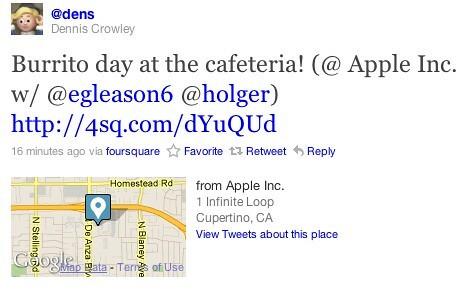 Perhaps Apple is getting some “assistance” on this new network – presumably coming in iOS 5 – from the Foursquare team. Looking at which executives are there, the possibilities are seemingly endless at this point. Thanks, Jim D.